It’s sort of like Sliding Doors or Kiewslowski’s Blind Chance with a lot more rain and guns. On his first day with Inspector Khan’s special anti-crime unit, a fresh recruit confronts a suspected murderer, sans back-up. 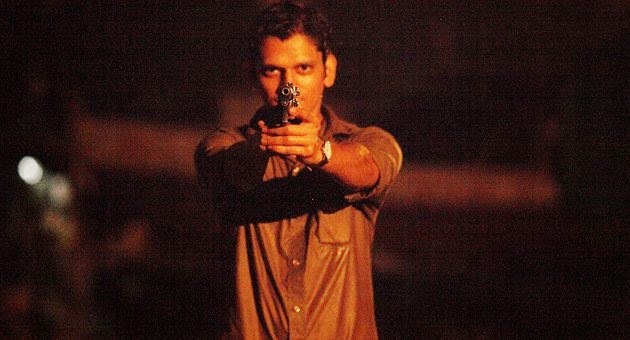 He will either freeze, shoot to kill, or possibly split the difference in Amit Kumar’s muscularly moody crime drama, Monsoon Shootout (clip here), which screens during the 2014 Cleveland International Film Festival. As the son of a totally above-board cop, the green Adi is a bit shocked by Khan’s borderline vigilante tactics. Mumbai’s top brass makes a show of tut-tutting at the frequency his suspects are shot while trying to escape, but it is clear they are turning a blind eye. Khan is determined to bring down the Slum Lord, Mumbai’s descriptively named vice and extortion kingpin. His best lead is Shiva, one of the Slum Lord’s most reckless and dangerous assassins. After a rocky start, Adi’s brief career goes from bad to worse when he faces Shiva in that classic dark alley setting. Should he shoot or stand there flat-footed letting Shiva escape? Khan will have some choice opinions regarding either decision that he will express as viewers watch Adi’s alternate timelines play out. One of the cool things about Shootout is the way the competing narratives parallel each other in clever ways, despite the distinctly different choices made by poor hapless Adi. At various times, he seeks treatment from his ex, Anu the nurse with a social conscience. By the same token, he always tracks down Geeta, a prostitute favored by Shiva. Conversely, radically different sides of Khan’s character present themselves during each variation on the theme. As Khan, Neeraj Kabi excels at grizzled badassery, while bringing out more human qualities when the various circumstances allow. Nawazuddin Siddiqui’s Shiva also delivers enough glowering menace to satisfy any genre fan. While not a lot of heavy lifting is required of model-turned-indie actress Geetanjali Thapa, the more traditional romantic role of Anu represents something of a departure from her migrant workers advocacy films, such as I.D. She has passable screen chemistry with Vijay Varma, who broods as well as anyone could ask, even though Adi is to a large extent a passive puppet of fate. Even though Shootout has a somewhat gimmicky structure, Kumar deftly uses each take to build and expand the tragic irony. All three parts also hum along quite nicely as gritty procedurals. It is a quality production with considerable genre appeal, particularly distinguished by cinematography Rajeev Ravi, who makes the rain and nocturnal slums look like visual poetry. 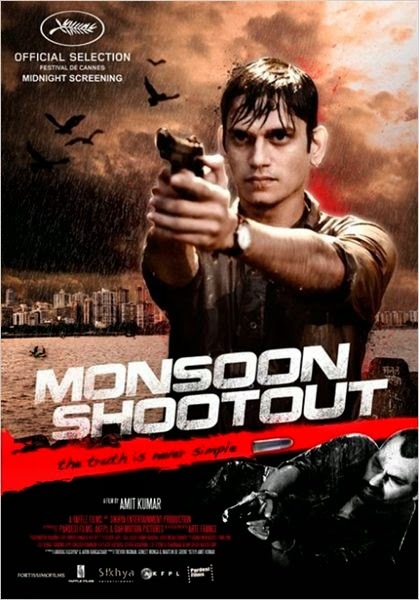 Recommended for fans of parallel and popular Indian cinema, Monsoon Shootout screens Saturday (3/22) and Monday (3/24) during this year’s CIFF.